Q. You are in the upcoming edition of Bay Area Now at the Yerba Buena Center for the Arts. Have you been to many Whitney Biennials or Bay Area Nows etc. before? What is your experience of these types of overview exhibitions? A. I actually haven’t been to any Whitney Biennials before! Shameful, I know. I moved to the bay (from New York) in 2007 and have only gone back to visit a handful of times, none of which coincided with the Biennial. I’m obviously curious about layouts and general scale/scope of artists’ work within a large survey like that, but I just haven’t had the opportunity to get there. BAN7 was the first one I had been to when I felt particularly immersed in the art scene here, but I’ve been to see a few in the past. A big draw for me to BAN7 was [ 2nd floor projects ] involvement, Margaret Tedesco is now my gallerist but has been a friend for over a decade, and getting to see her facilitate a really beautiful, very queer, very large installation was super inspiring. Q. It has been a hectic year for you - finishing your graduate studies at UC Berkeley and going straight into several exhibitions. For your practice, is this schedule productive - does it help to push you forward? Or is it hard to keep ahold of the thread of things? A. I feel so grateful for the shows I’ve had through the end of school, though finding a balance between wild and often stressful production-mode and casual, mellow studio exploration has been tough. I’ve operated from a place of scarcity for so long that it’s been a challenge to say no to opportunities but lately I’ve been trying to be protective of my time because I get so overwhelmed easily. All of that said, having deadlines on the calendar keeps pushing my work forward - I often think I want downtime, but once I get it I start to panic and get restless and it often ends up a vicious cycle. Q. Besides art and artists near and far, what other factors (people, media, ideas etc.) are currently motivating your practice? A. For the past few years I’ve been using my art practice to re-enter a consistent engagement with a Jewish identity, so there’s this exciting, very active and evolving back and forth happening with (ritual) objects and (ritual) practices that has been informing my studio work. I find the daily, weekly, monthly engagement with text and embodiment through rituals and liturgy to be so useful in its evolving qualities and really mirrors the way I keep going back to similar forms and aesthetics. Last summer I went to a Talmud study retreat up north (SVARA Queer Talmud Camp at Walker Creek Ranch, outside Petaluma, CA but they’re based in Chicago). It was my first real interaction with this specific text, and I was really struck by the way the text itself is a layering, a collage or dossier of some sort, of different scholars’ ideas and ways to digest Jewish law. The person compiling (and inserting his own opinion!) is creating this deeply layered time-expansive site to digest laws and practices. Really amazing and I think speaks well to the evolution of an art practice, and specifically auto-recording material processes like ceramics, where the process of making gets marked into the form itself. So inspiring! Q. Bay Area Now implies contemporary, now, what is happening now. Which is important certainly, but are there artists or ideas from the not quite now that you feel have a resonance with your practice? A. For sure, I mean, like I said, Talmud and ancient Jewish texts, the “architects” of a lot of contemporary Jewish law and practice are feeding into my work a ton right now. Really just exploring my feelings about Jewish practice and identity through my creative output. Lately I’m feeling totally obsessed with incantation bowls, these really beautiful ritual objects that are these text/object hybrid amulets. As I’m re-learning Hebrew, work like this feels particularly inspiring. 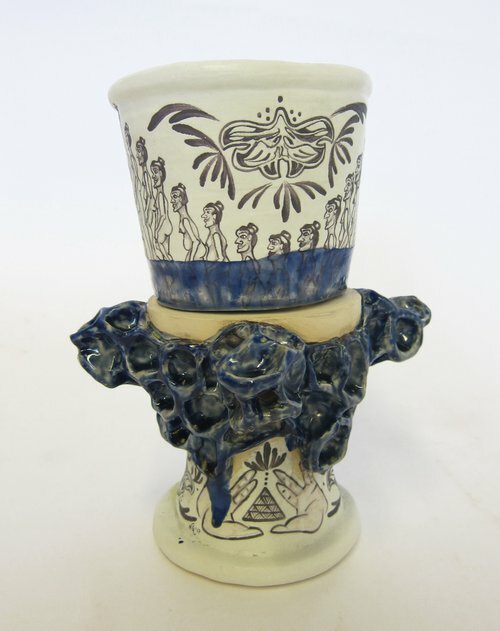 That said, I’m also really inspired by ceramics history- fired ceramic is a permanent material, so it records both what’s illustrated or written on it but also the body’s imprint recorded into it’s form. This has played a huge role in the way my work has gotten “sloppier” - this interest in allowing the hand print to be visible. I keep thinking about earnestness, objects showing a viewer exactly what they are, making work that reveals its making process and isn’t pretended to be anything except exactly what it is. There are these in-process ketubot (marriage contracts) at the Magnes Collection in Berkeley in a show I made work for about Karaite Judaism - they’re unfinished and the typically ornate decoration is only mapped out in pencil, maybe the beginnings of watercolor-ing it in. There’s something so amazing to me about this - the architecture of the image being so clear and a part of the work. Q. Referring back to the first question: no shame in this! There was a ton of talk about the biennialization of things a few years back, the proliferation of these shows and their effect on the local scenes. In most of the biennials, it is artists from outside a region being flown in to do a huge show somewhere else. But like Made in LA, this is a show of the Bay Area's art scene. What do you think of our scene? A. I really love the scene here. I’ve lived in the bay for over a decade now, and I feel like it’s taken all this time to feel connected to art community here in some way. There’s a rough-around-the-edges-ness that really speaks to me here. I really recognize the challenges or limits of the city/region's provinciality, but I get really excited by these larger, more visible shows and the way that as a region we’ve had some pretty big art moments in the past few years- thinking about the opening of Minnesota Street Projects in particular, but just the way that despite the shifting landscape of the area, the art scene here still pushes to have making work feel more accessible. Finding the time and space is always a challenge, but I really believe in working with what you have access to and feeling grateful for that. So I’m just chugging along, really. I’m so excited to be moving my studio up to the Headlands this year. People keep asking if they have ceramics facilities, and while exploring making ceramic work in that space feels inspiring, I’m also curious to see what emerges as it becomes so much less immediate and accessible. We’ll see I guess. Q. Kinda extending the question of the last one, what does the Bay need more of in your opinion? Or less of? A. I want to see more afternoon openings! I’m only slightly joking, I go to bed early and wake up early and always get so excited when a rare opening is like 2-5pm or something. It’s so good to get some socializing in but also to be home early for dinner and winding down. Nicki Green, Poisonous Mushroom, 2018. Glazed stoneware. 45" x 34" x 30"
Nicki Green, Texture Studies (gills), 2018. Glazed stoneware. 17" x 17" x 3"
Nicki Green, Quilted Lavender Hanky #2. Quilted cotton and polyester, 12.5" x 12.5"
Nicki Green, Swaddle, 2017. Bricks from Peter Volkous' gas kiln at University of California, Berkeley, felt, nylon strapping, props. Dimensions variable. Nicki Green, Breaking Dishes at Gene Compton's, 2016, Custom decals and china paint on found mugs from thrift stores in San Francisco. Edition of 50. Dimensions variable. Signed and numbered Edition of 50 commemorative mugs released August 16, 2016 at the GLBT History Museum in San Francisco. Mugs also sold on site, also on site at The Tenderloin Museum (SF) and on The Tenderloin Museum Web Store.